MIG, flux-cored, DC stick and DC TIG processes, allowing you to build your skills. Auto-Set Elite can be used on multiple materials and multiple processes with the ability to fine-tune your settings. Simple to set up and use! Inverter technology combines best-in-class arc characteristics with the portability of a 29-pound machine. The arc is extremely forgiving to variations in arc length and travel speeds. The Multimatic 200's impact-resistant case provides strength and durability, protecting the internal components and welding wire. Multimatic 200 offers positive arc starts and an extremely stable arc with minimal spatter on both mixed gases and straight CO2. Multi-voltage plug (MVP™) allows you to connect to common 120 or 230 V power receptacles without the use of any tools—choose the plug that fits the receptacle and connect it to the power cord. Direct-connect spool guns are a reliable and economical solution for welding aluminum. The Multimatic 200 DC TIG Contractor Kit gives you everything you need for remote DC TIG welding with the Multimatic 200. Miller's Fan-On-Demand technology operates only when needed reducing noise, power consumption and the amount of airborne contaminants pulled through the machine. 250A rated output. Next-level advancements include a comfortable new handle with rubber overmolding and rear swivel, optimized wire-feed path for reliable performance, and simplified maintenance. Reliable and economical direct connect Spoolmate™ 150 spool gun provides 20 ft of cable reach and accessibility. Provides smooth feeding of 4000 and 5000 series aluminum wire. For the Multimatic 200. Kit comes with Weldcraft A-150 TIG torch with Dinse-style connector. RFCS-6M foot control, flow gauge regulator with 12-foot gas hose, and AK2C torch accessory kit. Reliable and economical direct connect Spoolmate™ 100 spool gun provides 12 ft of cable reach and accessibility. Provides smooth feeding of aluminum wire. Durable construction with rubber rear wheels and Cylinder Rack. For use with Millermatic® 125 Hobby, 141, 190, 211, Multimatic™ 200, 215 and Diversion™. Converts Running Gear / Cylinder Rack 301239 from a single cylinder cart to a dual cylinder cart. Top bracket is able to hold a variety of tools including a welper, adjustable wrench, screw drivers, chipping hammer, wire brush and filler rod. For use with MDX-250 MIG Guns and Bernard BTB MIG Guns. Pair with AccuLock S Contact Tips, D-MA250 Diffuser, AccuLock MDX Liners, Power Pin Caps. Use with AccuLock S Contact Tips, Nozzles and AccuLock MDX Liners and Power Pin Caps. Owned and operated by friends Jerry Zaiden and Jason Campbell, Camburg Engineering is a leader in off-road suspension systems and is at the forefront in technology and design. With a shop over 10,000 square feet, Camburg is one of few off-road companies with the manufacturing capabilities to produce their own suspension components in-house as well as build their KINETIK race trucks from the ground up. The company's ability to design, build, race and win using their in-house components sets the organization apart from the rest as they establish the trends rather than follow the crowd. Read on and watch these videos below to learn more see how they use Miller product to get the job done. When welding in the field, versatility is key, especially for companies that are never quite sure what projects they'll encounter day-to-day. According to Westfield, Wis.-based High Tech Welding, having the right equipment is the biggest contributing factor behind their ability to maintain high quality levels, meet their customers' stringent requirements and deadlines, and establish an acceptable profit level. That's why High Tech Welding relies on Miller equipment and recently turned to the Miller Multimatic™ 200 all-in-one multiprocess power source to increase productivity by 25 to 30 percent on its field repair and fabrication jobs. Miller is currently prepping for an exciting 2012 SEMA Show - the largest automotive specialty show in the world. Held Oct. 30 – Nov. 2, 2012 in Las Vegas, attendees can experience hands-on welding and cutting demos from Miller Electric Mfg. booth #24013, in the Racing & Performance pavilion, located in the Central Hall of the Las Vegas Convention Center. High Tech Welding relies on Multimatic™ 200 multiprocess to increase productivity on field repair and fabrication jobs. Multimatic™ 200 received an award as the "Best New 'Tools and Equipment' Product" award at SEMA 2012. The Miller Multimatic 200 MIG/TIG/Stick Welder won the award for best new tools & equipment category at SEMA 2012. 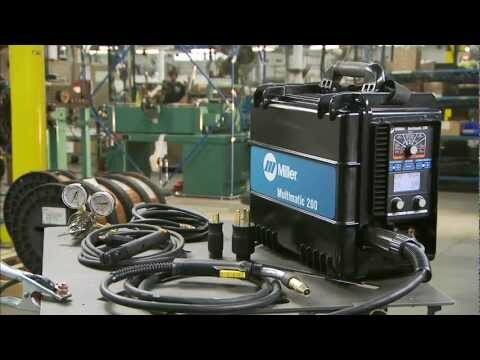 Watch this how-to overview of the Multimatic 200 multiprocess welder to set up MIG, TIG and Stick welding. This is a simple set up procedure for the Miller Multimatic 200 in Lift Arc TIG mode, without using a remote.